It was a night to remember when the Raiders christened the Beyer-Small ’76 Field at the end of August. 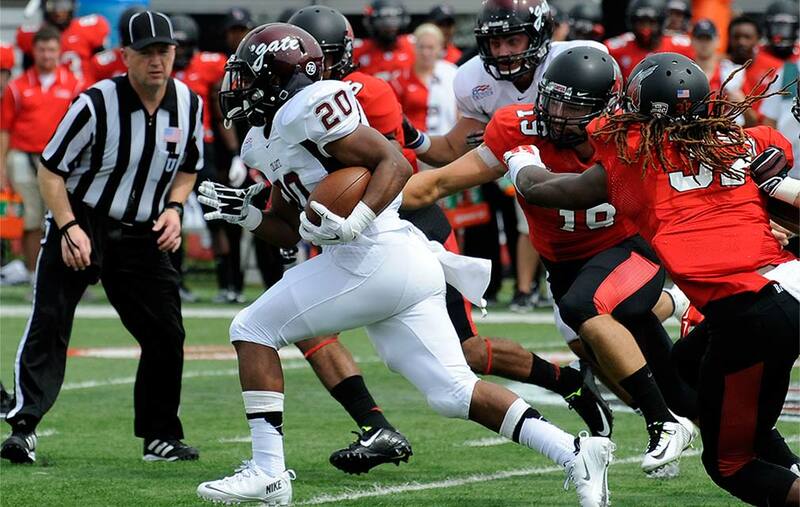 A standing-room-only crowd packed Colgate’s new stadium, watching anxiously as the game went into double overtime. 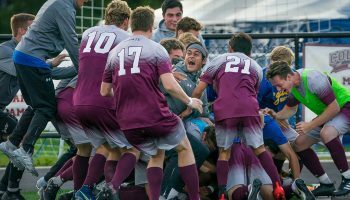 Fans erupted as Ethan Kutler ’17 notched the game winner thanks to a penalty kick in the 102nd minute, lifting Colgate 1-0 over Saint Mary’s. The Raiders are now competing on one of the very best facilities in the country, said head men’s soccer coach Erik Ronning ’97. Beyer-Small Field “enables us to prepare and compete at the highest level of college soccer,” he said. 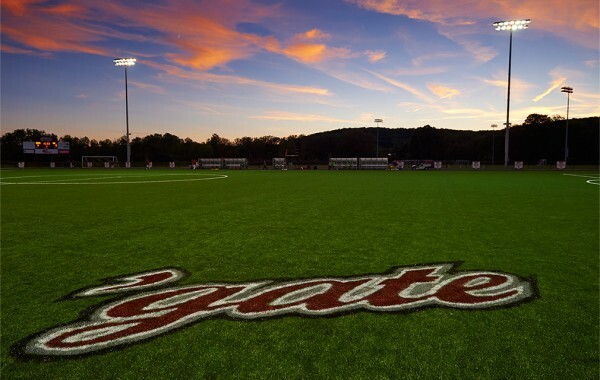 “It is with great pride and enthusiasm that the women’s soccer program begins this new chapter,” said Kathy Brawn, head women’s coach, as she reflected on the positive changes she’s seen throughout her 24 years at Colgate. Her team drew 0-0 against Colorado College in its home opener. Earlier that evening, the new field’s namesakes took part in a ceremonial ribbon-cutting ceremony along with President Jeffrey Herbst and athletics director Victoria M. Chun ’91, MA’94. John Beyer, who was the men’s soccer head coach from 1966 to 1979, led the team to an 81-66-15 overall record with six All-Region players and one All-American (Barry Small ’76). 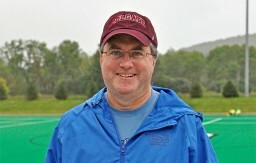 Beyer also coached the women’s team for two years in the early 1980s, posting a 22-10-1 record for a combined 103-76-16. Small earned All-America Second Team honors in 1975. The four-year letter winner ended his Colgate tenure fourth on the school chart in career goals with 22 and third in points with 48. The 1975 team captain, he was twice named All-New York Region by the National Soccer Coaches Association of America. 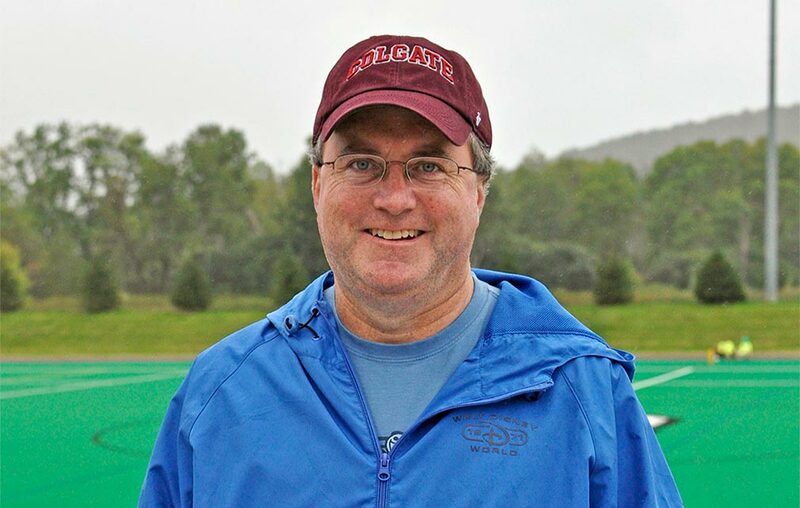 As an alumnus, Small served nine years on Colgate’s Board of Trustees, and was instrumental in the establishment of the John Beyer Endowed Coaching Chair for men’s soccer. Check out more photos of opening night at: www.colgate.edu/fieldopening. Pro cyclist Kathryn Bertine ’97 raced the inaugural La Course by Tour de France, which she helped to create. Recognizing the obstacles facing female cyclists, Kathryn Bertine ’97 is paving a new course. In July, she competed in La Course, a race for women, sponsored by the Tour de France, that her activism group helped create this year. More than 100 women participated in the 56-mile race on the Tour de France’s final circuit, finishing down the Champs-Élysées. The one-day event took place on the same day of (but ended shortly before) the conclusion of the male-only, 23-day race. 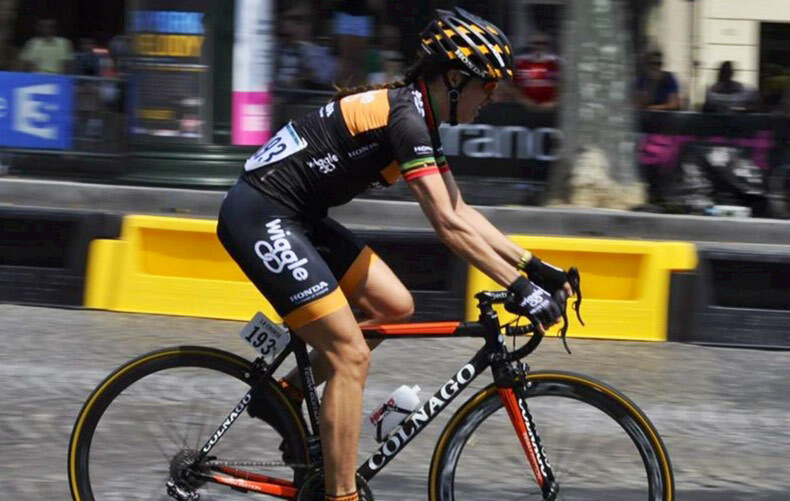 Bertine competed for Wiggle Honda, the leading British professional trade team. In fact, the Tour de France previously had an equivalent race for women between 1984 and 1989 that was disbanded because of organizational and funding problems. Bertine and her cofounders campaigned to persuade the race organizer Amaury Sports Organization to bring back and host the women’s race. Through Change.org, they garnered 97,000 signatures in just three weeks. Reflecting on the race, Bertine said, “Off the bike, this race is something I’ve been working toward for a long time. On the bike, standing on the start line of my own dream is and will always be the highlight of my racing career. When Bertine is not training on her bike, which she does six days a week, she is an ESPN journalist, author, and documentary filmmaker. Her third book, The Road Less Taken, was published in September (see this issue’s New, Noted & Quoted section). “I want to be part of the change that brings women’s sports into the limelight and celebrates strong women,” said Bertine. Josie Stockill ’16 had a little side trip to make before returning for the start of fall classes. Hailing from Napier, New Zealand, she was one of 12 players named to her country’s women’s national basketball team. In late August, the New Zealand Tall Ferns traveled to China for the 2014 JinQiang Cup Four-Nation Women’s Basketball Tournament. They played a combined six games against a U.S. select team and the national teams from Slovenia and the host nation. Stockill had spent five years with New Zealand’s Junior National Team and earned MVP honors for her Under 17 team during the 2009 national championships. In 2010, she played on the Under 19 team at the FIBA Oceania Qualifiers, and in 2011 competed for New Zealand’s Under 20 team in the state championships in Australia. During her two seasons at Colgate, the forward has played in all 61 games with nine starts. 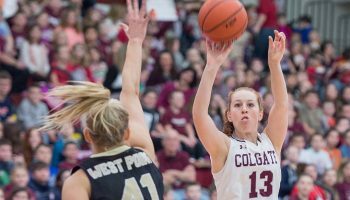 She was a Patriot League All-Rookie Team member her first season and already owns 68 career blocked shots, good for ninth-best in Colgate history. 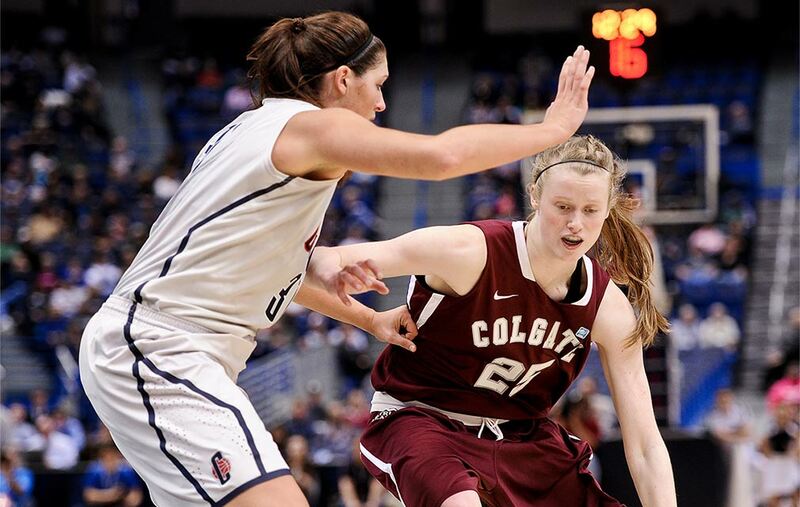 Learn more about the Colgate women’s basketball team. 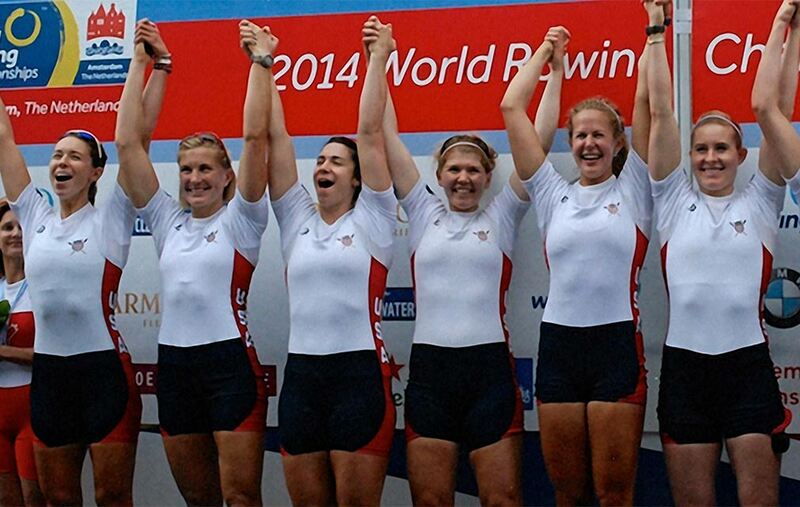 Lauren Schmetterling ’10 and the U.S. women’s eight crew captured another gold medal with a victory at the 2014 World Rowing Championships in Amsterdam at the end of August. It was Schmetterling’s second turn on the victory stand in as many years and the ninth consecutive first-place trophy for the U.S. women’s eight at an Olympic Games or world championship. 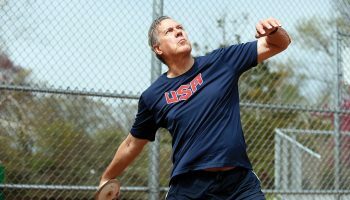 At the start of the championship final, Canada was with the United States stroke for stroke, but that lasted only a few hundred meters. The U.S. women’s eight dynasty had been working on the front end of their race, and once they pushed into the lead, it was all over. Seat by seat, they pushed the Canadians back as the buoys flew by, winning gold in 5 minutes and 56.83 seconds in front of Canada and China. 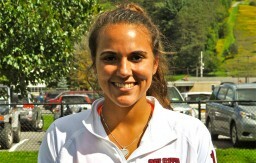 Learn more about the Colgate women’s rowing team. A new era at Lineberry Natatorium began with the announcement of Andy Waeger as the Mark S. Randall Head Swimming and Diving Coach. Waeger arrived from Texas Christian University (TCU), where he was assistant coach for the Horned Frogs of the Big 12 Conference for two years. He previously served as women’s head coach at Lock Haven University and as men’s and women’s head coach at Slippery Rock University. “Andy understands what it takes to lead student-athletes to excel at one of the best academic universities in the nation, while offering them a superb Division I athletics experience,” said athletics director Victoria M. Chun ’91, MA’94. Waeger takes over for Fernando Canales, who left after four seasons to assume duties with the Turkish National Team. At TCU, Waeger assisted in all phases of the Horned Frogs men’s and women’s program. He was the men’s team coordinator and overall recruiting coordinator as well as the breaststroke and butterfly stroke group coach. He helped TCU establish 30 school records and 151 top-five performances. The Horned Frogs earned 73 All-Big 12 Conference honors, 87 NCAA “B” cut performances, and eight Academic All-American honorable mentions. A native of Dublin, Ohio, Waeger started out his coaching career as a student assistant at Fairmont State College in West Virginia, where he had been a four-year letter winner for the Fighting Falcons. As a senior, he took the conference title in the 200 breast and 400 medley relay along with serving as a team captain. He holds a bachelor’s degree in education (2002), and a master’s in sport management (2004) from Slippery Rock. Learn more about the Colgate swimming and diving team: men’s and women’s. Three Colgaters in the lacrosse world hit some high marks this summer. Two of them helped the U.S. National Team to a second-place finish at the FIL World Lacrosse Championships in Denver in July. 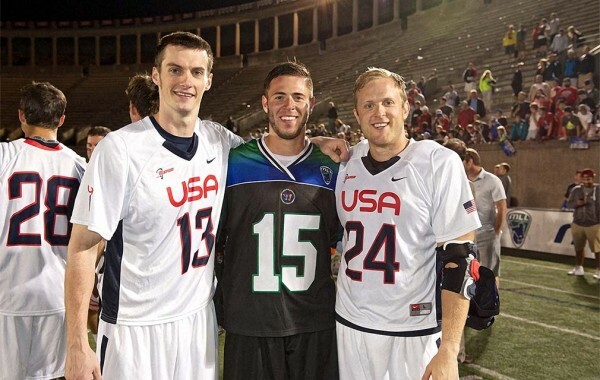 Chris Eck ’08, who plays professionally for the Boston Cannons of Major League Lacrosse (MLL), “was dominant throughout the entire tournament at the face-off X,” said Mike Murphy, head coach of Colgate’s men’s lacrosse. Winning 65 of his 87 face-off attempts for a 74.7 percent success rate, Eck added 42 ground balls and caused one turnover. As a Raider, Eck starred at midfield, earning one All-Patriot League first-team selection and two second-team nods while helping the team to the 2008 Patriot League championship. 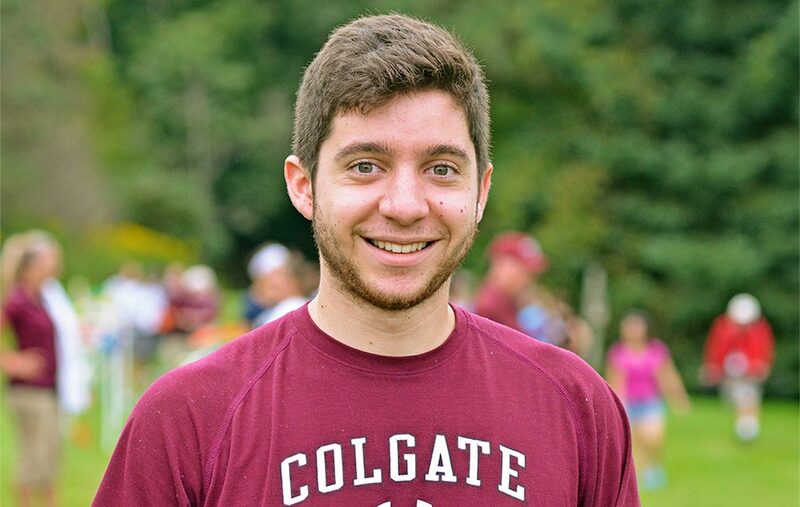 Matt Abbott, Colgate’s volunteer assistant coach, performed as a defensive midfielder. He started three games, posting 11 ground balls and causing two turnovers from his defensive midfield position. An All-America performer at Syracuse University and key member of the Orange’s 2008 and 2009 national championship squads, Abbott is currently a midfielder for the Chesapeake Bayhawks. Abbott, who put up eight goals and eight assists this season, was also selected by the league’s game officials for the inaugural USL/MLL Sportsmanship Player of the Year Award. The six-year veteran, known for his positive behavior on and off the field, is thought of as one of the best all-around lacrosse players whose versatile skills allow him to assist his teammates however needed. He now helps the Raiders alongside his brother, assistant men’s lacrosse coach Mike Abbott. In other MLL honors, Peter Baum ’13 was named by the league’s head coaches and general managers to the 2014 MLL All-Pro Team. He finished third in goals with 35 after leading the league for most of his rookie season, amassing 50 points to help him earn one of the 12 places on the team. Earlier in the summer, Baum was selected to and scored in the MLL All-Star Game, playing against Abbott and Eck. Howard Blue ’04 wants his students to know that he’s on their team. 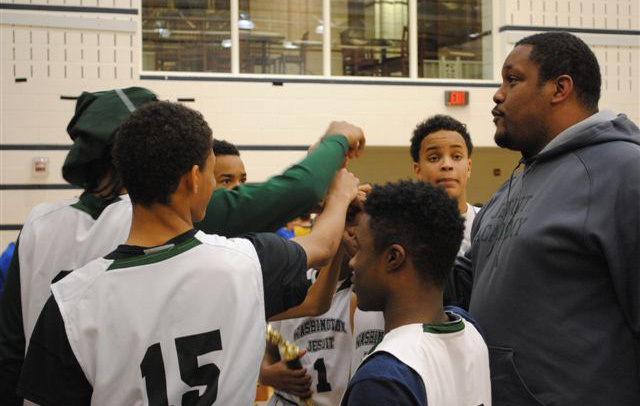 As director of athletics and graduate support at Washington Jesuit Academy (WJA), Blue works with 5th- through 8th-graders from low-income families. “We provide a high-quality and comprehensive education to boys, offering them a safe, rigorous academic setting, and advancing their spiritual, intellectual, emotional, and physical growth,” said Blue, who is now in his 10th year at the academy. He returned to teach in his hometown of Washington, D.C., after Colgate because he wanted to help kids from similar backgrounds to his. “It is important that we support our students through high school, with the graduation rate among minority men in the country — and especially D.C. — being as low as it is,” he said. Devin went off to college. Blue made another Colgate friend from D.C. on his senior-year official visit when he spent time with basketball player LaMarr Datcher ’02. 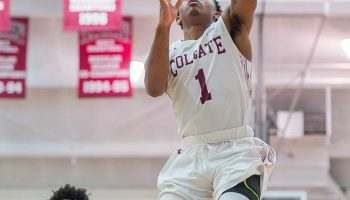 The four-year basketball letter winner made the Patriot League All-Rookie Team his first season and went on to stamp his name throughout the Colgate career charts. He finished 16th in scoring with 1,201 points and also was sixth in field-goal percentage, 11th in steals, and 12th in rebounding. He was team captain his senior season alongside Mark Linebaugh ’04, who now directs Colgate’s basketball operations. 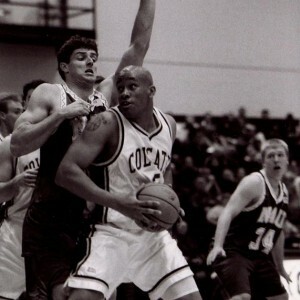 Finishing on a high note, Blue earned All-Patriot League Tournament honors in 2004 after an injury had limited his play during the regular season. Blue’s Colgate-D.C. connections continue today. One of his WJA coworkers is J.B. Gerald ’04, a wide receiver and key contributor on the 2003 football team that made it to the Division I-AA national championship game. Gerald helped Blue start WJA’s athletics program, which includes football, soccer, baseball, track, and basketball. The two also coach football and basketball together, and led the basketball team to winning back-to-back city titles. “We produce some of the finest and most complete student-athletes in the D.C. area,” Blue said. Whether it’s on the court or in the classroom, Blue ensures that his students know he’s in their corner. My niece, Katelyn Francese ’15, plays field hockey. Is there anything different about Colgate sports today, compared to when you attended school here? The facilities are dramatically better. Tyler’s Field didn’t exist, and the stadium portion of the football field wasn’t there, either. Tell us something sports-related about yourself. I play a lot of golf, and I’ve played golf a lot here. My wife and I used to play here for about 10 years, before we had kids. Why did you come to the meet today? A lot of my friends are on the team, so I came out to support them. They are seniors on both the men’s and women’s teams. What is your favorite thing about coming to see the cross country meets? They just look so good when they’re running. They really do. Have you seen a Colgate athlete do anything today that really impressed you? Nick Harper ’15, one of my very good friends, started his warm-up late and caught up to the rest of the team. What is your favorite thing about coming to watch soccer? It’s not choppy like other sports where you hear the whistle blow twenty-four/seven. It’s very flowy and fun to watch. What do you think of the new Beyer-Small ’76 Field? Oh, I love it. It’s so nice that it ties Tyler’s Field and Andy Kerr [Stadium] together. What is one of the most important things about sports to you? I play on the lacrosse team. Working hard, and a sense of family are important. You always have someone who has your back, so you always want to work hard for the other people.